Consumer reports issued by ChexSystems track bad banking behavior and warn banks of risky checking account customers. Beware bank customers: Your bad behavior is following you. If you've bounced too many checks, owe money on an overdrawn account or engaged in fraud, banks can find out about it and deny you a checking account in an instant. In fact, millions of people are blocked from opening checking accounts each year because they were flagged as high-risk by a massive but little-known database maintained by a company called ChexSystems. While many people have no idea this database exists until they're denied a bank account, ChexSystems likely knows who you are. Formed 40 years ago, the Woodbury, Minn., company now holds data on more than 300 million consumers and provides consumer reports to 80% of the nation's banks. It was acquired by financial service provider Fidelity National Information Services in 2007. The company's reports include the number of accounts closed due to abuse or fraud, when an account was closed, the amount owed and whether the balance has been paid. It also includes any history of payday loans and bounced checks. Consumers can request a free annual report on the company's website, Consumerdebit.com. Most negative information on a person's report stays in ChexSystems' database for five years, according to ChexSystems. Information isn't removed before then unless it's disputed by the consumer and determined to be inaccurate by the bank or credit union that provided it to ChexSystems. Based on information in ChexSystems reports, a score ranging from 100 to 899 is given to each person who applies for a checking account. Martin Romain, a senior vice president at Fidelity National Information Services, said 80% of people in the database who apply for accounts typically qualify for standard or premium checking accounts. Of the remaining applicants, about 10% have low scores (between 100 and 546), while another 10% have "near low" scores (from 547 to 580). Having a low score doesn't necessarily mean you won't get a bank account, but it can mean more fees or restrictions. Some banks will offer low-score applicants prepaid cards or special accounts that are carefully monitored and lack typical checking account features, like debit cards or e-banking, said Romain. Applicants with "near low" scores are sometimes offered "no frills" accounts that may not have the same level of surveillance, but still don't come with features like e-banking and bill pay. Romain estimates that 5% or less of applicants are unable to qualify for an account at all -- which would only occur if someone has a history of fraud or frequent abuse. ChexSystems declined to say how many people in its database are denied accounts each year. But by one estimate, some 2.3 million people who apply for accounts online were denied last year. That's according to Andera, a company that supplies software that banks use to process online account applications. The estimate is based on Andera's rejection rate and nationwide online application data. And it doesn't include applications rejected in bank branches -- where most people apply for accounts. Even though checking accounts don't carry the same risks as products like credit cards, they can still cause big losses for the banks. When a customer overdraws an account and doesn't pay back the outstanding balance or fees, the bank is left holding the bag. Fraud, including identity theft and forgery, is also a major concern. Nessa Feddis, senior counsel at the American Bankers Association, said the point of ChexSystems is to warn banks about risky customers and bar certain applicants from getting accounts they can't properly manage. "It makes sense to warn other institutions of people who have caused a loss in the past because they are more likely to cause a loss than someone who hasn't done so," said Feddis. ChexSystems isn't the only way banks vet account applications. Some use a company called Early Warning Services, which was launched in 2006 by a consortium of five of the nation's largest banks. Early Warning Services declined to be interviewed for this article. Banks also use data from various agencies to verify an applicant's identity and provide criminal records, and some even look at credit reports from the major credit bureaus. Unfairly blocked? : Not everyone who gets a low score in the ChexSystems database necessarily deserves it, said Chi Chi Wu, a staff attorney at the National Consumer Law Center. Customers can get trapped in an unexpected cycle of debt as a result of overdraft fees that can add up to hundreds of dollars, she said. Those who can't afford the fees and have their account closed by the bank receive a black mark on their ChexSystems report, and they can end up being denied bank accounts for years as a result, said Wu. Other people claim that information on their reports is inaccurate, and a handful of consumers have sued ChexSystems for allegedly including incorrect information on their reports and failing to investigate or correct it. Last year, ChexSystems settled a class action lawsuit in which the plaintiff claimed that ChexSystems unfairly "blackballed" her from getting a bank account, according to court documents. 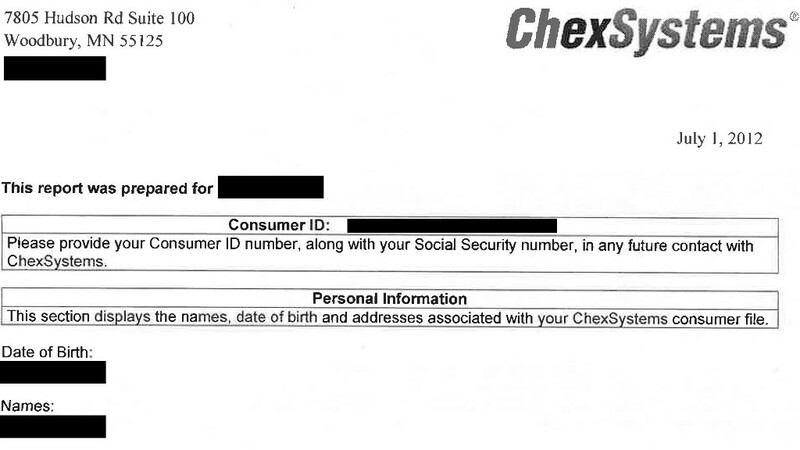 Under the Fair Credit Reporting Act, ChexSystems is required to investigate consumer disputes about the accuracy of items on their reports. And if a consumer disputes the outcome of an investigation, the agency must include a statement of dispute on the report. But the plaintiffs in this case claimed that the agency failed to include their statements of dispute on their reports. ChexSystems denied the allegations but agreed to pay each class action member $82 per valid claim -- up to a total of $278,000 for approximately 3,400 potential claims. It also agreed to change its business practices so that fewer statements of dispute are excluded from consumer reports. ChexSystems declined to comment on any litigation. While the company must abide by certain federal laws, including the Fair Credit Reporting Act, it has not been regularly supervised or subject to on-site audits by any government agency. But the Consumer Financial Protection Bureau, the watchdog agency that Congress set up two years ago to protect consumers from harmful financial products and companies, hopes to change this. 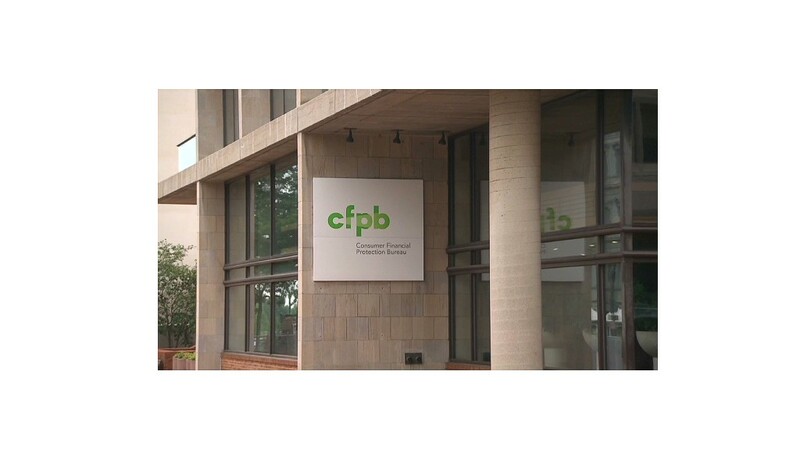 The CFPB announced a rule last month that will allow the agency to supervise consumer reporting agencies, including "specialty" ones like ChexSystems. Under the rule, the consumer watchdog will be able to conduct examinations, investigate any unfair business practices and write new rules. "Federal supervision will not only be important, it is a game changer," said Wu. About 7.7% of U.S. households -- or 9 million -- are unbanked, meaning they don't have checking or savings accounts, according to the FDIC. And Wu said many consumers denied accounts are becoming part of this group. "The people who are denied fall off the mainstream credit and banking map and join the ranks of the unbanked," said Wu.